Many times people mistake what a man wears for what he is, or desire possessions and status in the hopes of attaining happiness or becoming a person of character. As Henry Ward Beecher once quipped, "He is rich or poor according to what he is, not according to what he has." In that vein, here is a story about the wise Sufi storyteller, Nasruddin, and an invitation he receives to attend a banquet in his honor. See if you can figure out his wisdom, and do you apply it to your everyday life, in your business, and with your customers? One day, it happened that someone said something to someone, who said something to someone else, who somehow formed the impression a certain wise Sufi, Nasruddin, was an important person. The result of this chain of folly was that he was invited to be the guest of honor at a caliph's banquet. Although he was puzzled by the invitation, Nasruddin was honored to be invited. At the appointed day Nasruddin presented himself at the door of the banquet hall. He had been walking all day in his usual simple garb to get to the city in which the banquet was being held in time, and it is supposed he could have used some freshening up. At any rate, the guards at the door took one look at the Sufi and barred the door. Nasruddin obliged them with the first part of their request. The banquet hall was located on the city square, and he recognized a friend's house on the opposite side. Walking there, he knocked on the door, and his friend answered. “Nasruddin!” his friend exclaimed and embraced him. They gave each other warm greetings and gratitude to Allah, glorious and merciful is He, for this meeting. Nasruddin came right to the point. “Do you remember that red brocade coat you wanted to give me last year?” he asked. 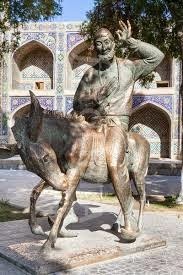 “What do you mean, Nasruddin?” he asked. “Just so, my friend. Thank you,” Nasruddin replied. They visited for a brief while, then Nasruddin bathed, received the coat and put it on. He made his apologies for the intrusion and departed back across the square, adorned with a dazzling brocade coat with gold braid and colored stones lining the epaulets. The buttons were ivory, the fastenings were jet black. All in all, it was a wonderful and dazzling sight. The guards bowed low at Nasruddin’s approach, and ushered him into the banquet hall. The table was richly laid, and all the guests were there. Someone showed him to a seat at the head of the table, and announced “The august, the wise, the true Nasruddin!” He sat, and everyone else sat at the same moment. They all watched expectantly, waiting to see what the guest of honor would do. The first course was soup. When it was served, all eyes were on him. Nasruddin picked up his bowl of soup and stood, holding it high. He then poured the soup down the front of his coat. To which the Caliph replied, "Again Nasruddin, I am humbled by your astute and simple wisdom. It is the man that makes the man, not his clothes."